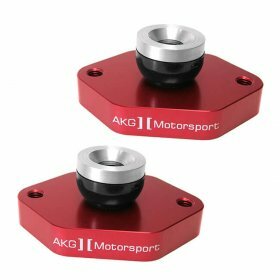 Rear Lower Shock Mount Set Aluminum, Poly Bushings for BMW E82 (128, 135), E90 E92 E93 (325, 328, 330, 335). 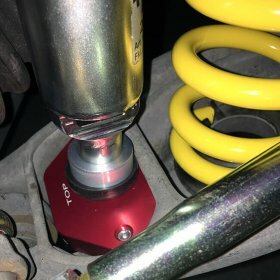 A true, performance aluminum lower shock mount for Non-M models! The stock lower rear shock mounts (RSM) are massive globs of rubber – this material deflects under load affecting the rear shock damping, especially with a modified suspension and increased shock valving. Upgrading your street stock, rubber mounts to these aluminum performance rear lower shock mounts will greatly reduce this movement, helping to keep the shock in place for proper performance. We recommend pairing these mounts with one of our Rear Upper Shock Mount Bushing Sets to eliminate movement at the top of the shock as well for the ultimate in performance and reliability. Made of solid CNC’d 7075-T6 aircraft-grade aluminum with U.S. Military Spec polyurethane (replaceable) bushings and stainless steel hardware. Hard anodized for corrosion resistance. Set of two.